We caught these issues during the editorial process, but somehow these items still slipped through! See below for some clarifications and corrections on Bernd Schmitt’s article, “A Life With Angels” as it appeared in the digital and print versions of AMAZONAS, Volume 2, Issue 1 – Jan/Feb 2013. Page 34, captions for upper images are miss-ordered. Caption (at left) from left to right are Gold Angelfish, Blue Angelfish, then poor quality angelfish, followed ultimately by the Koi Angelfish at far right. It goes without saying that the use of only common or trade names can cause great confusion, and the translation of Bernd Scmitt’s article is an exceptional example of this. Further confusion is assured given the interactions of outward phenotypes vs. the known and hidden genetics of designer Angelfish varieties. Amazonas Sr. Editor Matt Pedersen anticipated some concerns about the sections of our translated version of Scmitt’s text, as seen on page 34 and 35, and attempts to make some clarifications below. 1. Page 34 text – potential confusion may be caused by literal translations of common phenotype names from the original German text. Page 34, bottom – the cross of a “Black” angelfish (D/D) with the “original” form (+/+), based on our genetic understanding, produces fish that carry a single dose of the dark gene and are generally called “Black Lace” or simply “Lace” angelfish in the US – what author Schmitt calls “Smoke” in the text. 2. Page 34 and 35, the captions for the lower images may be inverted. 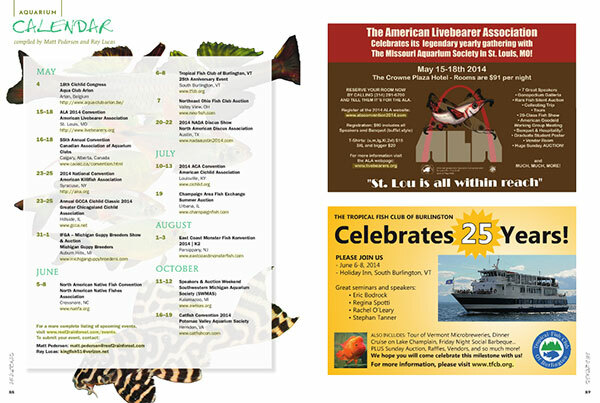 The fish at the bottom of page 34 (left) is generally known as a Smokey Angelfish in US-based Angelfish circles (Sm/+), and potentially should have the caption shown on page 35 for a “Smoke” Angelfish. The full text of the captions strongly suggests they are inverted (eg. “on the rear half of the body”) clearly points to the fish on page 34, not page 35. 3. If that is the case, then the the fish at the bottom of page 35 (right) is, per the author’s translated text, a “Half-Black” Angelfish – using the caption we printed on page 34. 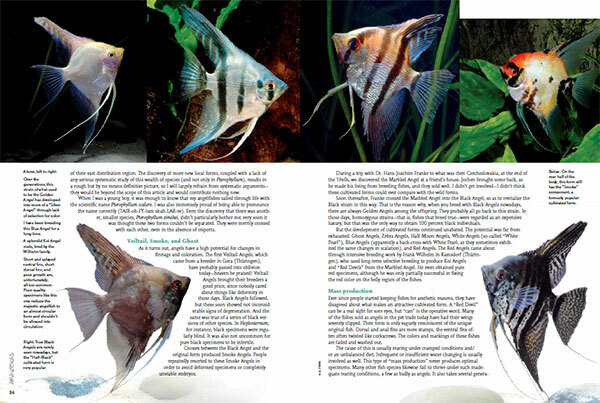 Halfblack Angelfish (h/h) are notorious for poor expression of the halfblack trait – an example of a well-expressed Halfblack Veil Angelfish can be seen in Pedersen’s article on page 50 (and shown at right), where the entire body behind the last body stripe, and all the fins, are black . The fish shown on page 35, bottom right may or may not actually be a fish carrying the halfblack genetic. 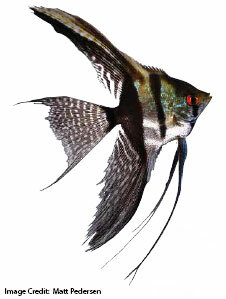 Given the context of the caption regarding “Black” Angelfish, Pedersen believes the “Half Black” the author was referring to being that it’s a “single-dose” (or “half” black) of the dark gene, which would make this a “Black Lace” or “Lace” Angelfish. A second example of the “Half-Black” not meaning “Halfblack” is seen in the caption on page 36, where a fish that is outwardly fully black is dubbed “Half-Black” in the caption. This solidifies the notion that the translated “Half-Black” in Schmitt’s text refers to a single-dose of the dark gene. 50% dark genetics, aka. half of a full black fish, and NOT Halfblack, not the genetic halfblack mutation. Pedersen also notes the extra body striping, pointing out that this fish shown probably carries the Zebra gene as well (see page 33). Most likely, in Pedersen’s opinion, the fish shown at the bottom of page 35 is a “Zebra Lace” Angelfish, (D/+ – Z/+). Of course, it isn’t that cut and dry, because Pedersen notes that in the translation of Schmitt’s text, the term “Smoke” is used to describe what US breeders would call a “Black Lace” fish (see point #1). Smoke? Smokey? Very confusing, and likely the result of multiple layers of translation and editing piling up. 4. Page 35 text – Schmitt talks about “White Angels” or “White Pearls”, and discusses that “Blue Angels” are the result of an apparent back-cross with the “White Pearl”. In fact, Schmitt’s “White Angels” are the “Platinum” penotype here in the US, with “White Pearls” presumably being “Platinum Pearlscales”…which have also been dubbed “Crystal” Angelfish by some sellers in the US! Regardless, Schmitt’s text is correct, although potentially confusing due to translation generating new phenotype names that are different from the US-based common names. According to community lore, the Platinum Angelfish originating from Asian producers were used to “tease out” the “Blue” gene. Our current understanding of Angelfish genetics suggests that a Platinum (g/g – pb/pb) when crossed with a wild type or original angelfish (+/+) ought not yield anything in this first generation back cross, as all fish would carry single doses of recessive genes (+/g – +/pb). 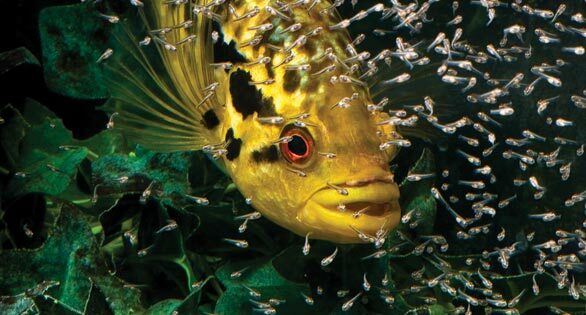 In the second generation result of crossing siblings together however, we would outwardly see Golds, Platinums, and Blues, along with many outwardly wild-type fish (again, those carrying hidden recessive genes). In much the same way that binomial nomenclature (scientific names) allows us to discuss a species across language barriers, so too, the genetic shorthand discussed in Pedersen’s article “Angelfish: Genetic Transparency Changes Everything” on page 48, allows us to cut through the confusion of “common names” for angelfish strains to better communicate across languages.